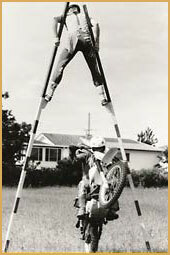 Australian Daredevil Johnny Fogwell (a.k.a. 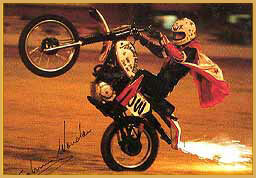 Johnny Wonder) has done all kinds of motorcycle stunt work. He started his career working the land and spent a fair bit of time on the rodeo circuit. 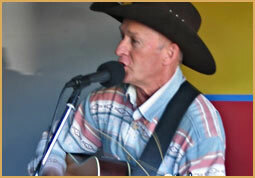 He also sang in a country band and got the name "The Singing Cowboy". 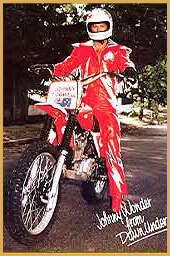 Johnny got into the motorcycle stunt world first by starting in motocross racing. 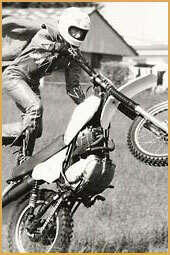 Then in 1969, he started jumping motorcycles. 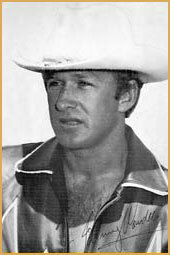 In 1971 he first cleared 2 cars and that started his career which had taken him near and far performing. 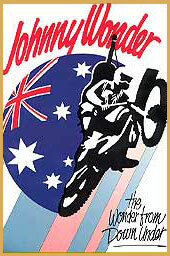 On November 16, 1978 in Brisbane, Australia Johnny smashed the long distance motorcycle jump record held at that time by Joe Einhorn (175 ft) by clearing 186 ft 5 ins. 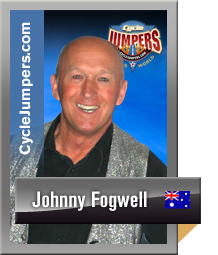 Johnny's next major jump and probably his most famous took place at Kianawah Park, Tingalpa, Brisbane, when at the age of 27 on November 19, 1979, he accomplished what was thought to be humanly impossible at that time and soared over 32 parked cars. 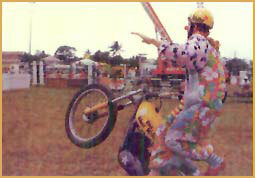 He made a perfect landing on a 6 foot wide down ramp before an ecstatic crowd of 5,000 fans. 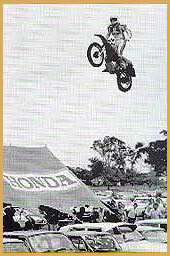 The jump was done on a standard XR 500cc Honda with a takeoff ramp that was 4 feet wide and a speed of 90 mph. Tailem Bend dragway near Adelaide, South Australia, was the setting for Johnny's next world record on December 16, 1979, when despite of gale force winds and wearing a double lined black BLINDFOLD, he jumped over 7 parked cars and touched down safely. Above photos are of Johnny during his jump off competition with Gary Wells. On April 13, 1980 Johnny participated in a jumping competition with Gary Wells of the United States. 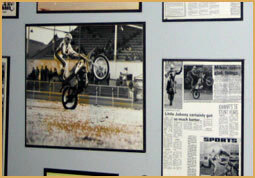 The jump took place at Calder Raceway in Melbourne, Australia. It was originally the third in a series between Dale Buggins and Wells, but Buggins couldn't make the engagement, so Johnny stepped in. Johnny had the first two jumps. On his first jump, midway between the ramps his bike started into a nose-first position and that was the way he landed, but he didn't crash (see photo). 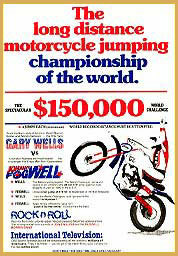 After a few modifications to his bike, Fogwell jumped again but this time it was perfect. On Johnny's third jump he did another perfect takeoff and landing and he looked all set to cover vast distances on his fourth jump at 150 ft.
As Johnny approached the ramp he was going a lot faster than his previous jumps. He jumped so far in fact that no only did he clear the cars below, but also the down ramp of 65 ft. What looked like a perfect touchdown turned into a spectacular crash. In a perfect landing position, his rear wheel hit first and the landing ramp unfortunately broke. He was then thrown forward and the front wheel collapsed. 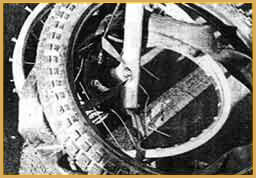 As the spokes at the top tore themselves out, the bottom spokes pushed into the tube and the front tire blew out. Fortunately the bike kicked sideways and Johnny and the bike slid into the pads. After a few minutes, he was back on his feet. Because he crashed, his jump was disallowed but was measured at a remarkable 63.6 metre (208' 9"). Gary Wells finished with a jump of 53.7 metres (176' 4.5";) to break his own world record. 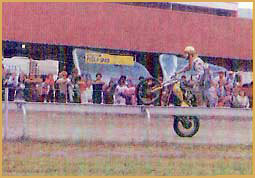 At Cairns Show Grounds in July 3, 1980, with a heavy dew on the ground and ramp and limited space, he soared over 12 trucks to beat fellow Australian, Dale Buggins record of 11. At Newcastle International Motordrome on November 8, 1980, Johnny established yet another World Record by jumping a massive 15 buses. 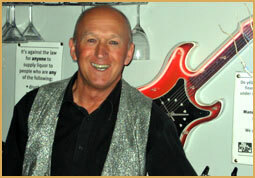 Today Johnny Fogwell is one of the stars of the show at his bar "Foggies" in the 60's theatre restaurant Velvet Waters. He is the wonderful Elvis Presley, Johnny 'o Keefe and many more, his singing ability is awesome and comes from years of singing as the "Singing Cowboy". 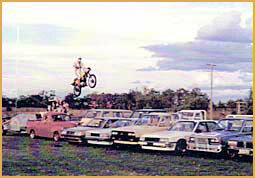 Left: Johnny's moving ramp jump, March 3, 1983 in Chinchilla, Queensland. 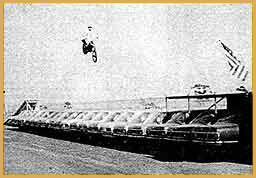 He jumped 7 cars (6+1 lengthwise)/ The take off ramp was being pulled by a FJ UTE by Steve Waldock. 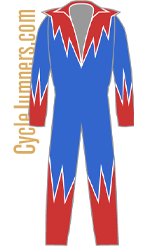 Right: Riding a wheelie. Left: Archerfield, Brisbane 1982 filming of the TV show "Wombat". 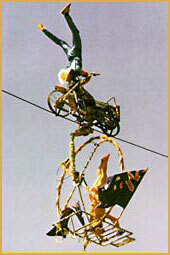 Right: Jumping 32 cars for a live television performance in Tingalpa, Brisbane. 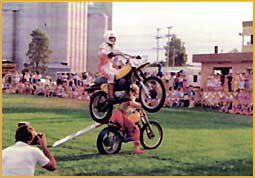 Left: Jumping from a plank across "One Wheel Willie's" TY250 Yamaha. Right: Performing at Cairns Showgrounds in 1983. Steve Waldock A.K.A. 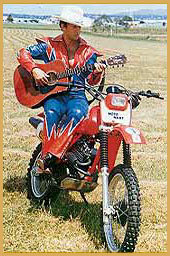 "One Wheel Willie" was a partner with Johnny Fogwell and started Wonder Promotions with him in 1982. 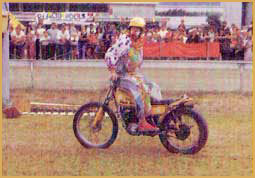 Steve was the "jack of all trades" and did trick riding as a clown in his show and did two extensive fair tours in 1983 and several other shows. The last time they performed together was at the Mad Motor Maniacs show at Archerfield Speedway in Brisbane. 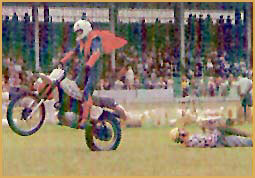 Left: Steve Waldock doing a 1/2 mile wheelie around the race track at a fairground show. 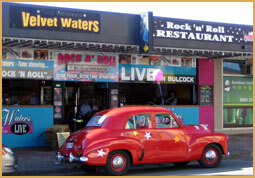 Right: Velvet Waters is where you can find Johnny Fogwell today! 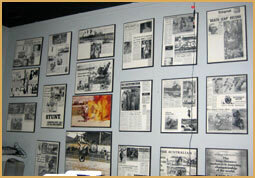 Johnny's daredevil career is prominently displayed in "Foggies" at Velvet Waters. You can also see his stunt bike on display. Left: Johnny in November 2010. 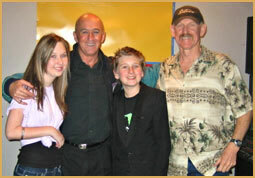 Right: Johnny with his daughter, son and Steve Waldock. Special thanks to Lawrence Legend and Steve Waldock for supplying this great photos and information about Johnny Fogwell.